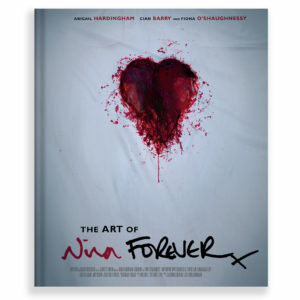 Nina Forever Collector's Edition DVD - darkly comic British romance. Nina Forever Collector's Edition DVD. Choose your unique cover artwork, all created by a range of brilliant artists inspired by the film. Also includes postcards from SXSW, StudioCanal and a 'lucky-dip' badge. REGION 2. Nina Forever Collector’s Edition DVD. Heartbreaking British romance struck with dark comedy and horror. Following the death of his girlfriend Nina (Fiona O’Shaughnessy), Rob (Cian Barry) is grief-stricken. But after a failed suicide attempt he begins to move on from the tragedy and falls for his colleague Holly (Abigail Hardingham). When Nina comes back from the grave to haunt them during their most intimate moments Rob and Holly try to figure a way out of their predicament. This Collector’s Edition DVD has unique artwork by artist Patrick Evereus, the original SXSW and Studiocanal postcards for the film and a free badge included. Audio Commentary – Sound – featuring award-winning Sound Designer Steve Bond, composer Dan Teper and artist Mara Carlyle. This package is sold directly by the filmmakers. Of the cover price, 20% goes to VAT, 5% to PayPal, the rest to the film-makers, who will give £2 per copy sold to the cover artist. By buying this you will help the filmmakers get one step closer to making their next film. So thankyou.